Thyroid removal (either total or only one side) is a common surgery performed by general surgeons as well as ENTs for thyroid cancer or masses suspicious for cancer. Though I no longer perform this surgery, I often get asked for my opinion regarding this surgery. Rationale for why surgery should be done or not, I leave to others as it would literally take a textbook, especially given the controversy regarding when to observe and when to surgically remove. Back when I WAS performing thyroidectomy, I should state my bias was towards removal... and belief that a needle biopsy is not 100% accurate. Indeed, in certain situations, a needle biopsy (FNA) is at best no better than flip of a coin whether cancer is present (it is wrong 50% of the time!). 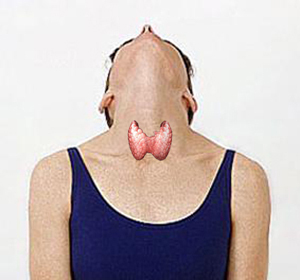 Given the thyroid is located over the windpipe, the surgeon may accidentally (or deliberately if thyroid cancer is invading the windpipe's wall) enter into the airway. Why may this be a problem? Well, it may cause air to leak into the neck causing it to suddenly swell up and potentially lead to a pneumothorax (collapsed lung) if severe enough. The scary thing is that it could potentially occur days after the surgery though if it is going to happen, it usually occurs within hours after surgery. Bleeding is ALWAYS a risk of surgery causing a hematoma to form. What makes this particular complication especially concerning is that it often occurs DAYS after surgery. Even more worrisome is that it could lead to death as the hematoma formation can cause significant swelling with resulting airway compression (remember that the thyroid is located over the windpipe). This particular complication unfortunately occurs not uncommonly... and often leads the patient to obtain emergency care in the local ER by a local surgeon to drain/remove the hematoma and stop the bleeding even if the surgery was done by surgeon located an hour or more away. A tracheostomy (a hole in the neck to the windpipe) may need to be performed at this time as well. The nerve that allows you to talk is called the recurrent laryngeal nerve. This nerve is RIGHT NEXT to your thyroid gland. As such, it can be damaged or cut resulting in a very breathy sounding voice. Oftentimes, it is temporary. Rarely, BOTH nerves can get cut if undergoing total thyroidectomy causing stridor or airway problems mandating a tracheostomy. In the event that a patient suffers a vocal cord paralysis from recurrent laryngeal nerve damage, it can be corrected surgically resulting in an almost normal sounding voice. If BOTH vocal cords are paralyzed... well... breathing and talking will be a problem and options are quite limited if this unfortunate complication occurs. With this type of nerve damage, you can talk just fine... but you lose your upper range and falsetto. 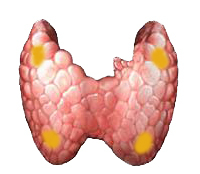 The parathyroid glands are located behind the thyroid gland in the 4 corners as depicted by the golden nuggets seen in the diagram to the right. These glands are very important regulating the calcium levels in the blood. In the devastating event that all 4 parathyroid glands get damaged or removed (as might occur during total or completion thyroidectomy), the patient loses the ability to maintain calcium levels in the blood resulting in cardiac and neurologic problems that could lead to death if not immediately addressed. Even if the parathyroid glands are preserved, if the blood supply to the 4 glands get cut off or damaged by the thyroid surgery, blood calcium levels may deteriorate. Thyroid surgery has risks and should be performed by a well-qualified surgeon. However, keep in mind that the best person to take care of you should you experience any surgical complication is the surgeon who actually did the surgery (one of many factors to take into consideration when considering having the surgery done far from home). Watch a video showing how a thyroidectomy is performed here!